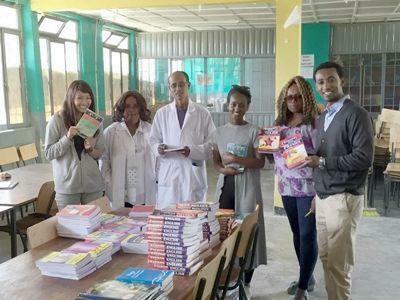 Students attending Yelebe Fana and Berhane Zare, two schools in Ethiopia’s capital, Addis Ababa, will start 2016 with access to 250 new books, thanks to a donation by Projects Abroad volunteers and staff in November 2015. The donation included academic books to support the students in their science, mathematics and English language subjects, as well as fictional books to encourage reading. “The public schools in Ethiopia lack necessary items to make the teaching and learning process more efficient. The evidence lies in the poor capacity of the schools’ libraries; this is why we were drawn to fill in the gap,” explained Minassie Alemayehu, Country Director of Projects Abroad Ethiopia. Yelebe Fana and Berhane Zare have a combined total of 5120 students ranging from ages 7-15. Both schools are funded by the Ethiopian government and offer free education to students who come from low-income families around Addis Ababa. The state covers teacher salaries and basic supplies, but funding for libraries and supplemental teaching materials is limited. Projects Abroad volunteers have previously donated children’s books, games, toys, and other teaching aids to these two schools. With the donation in November, Projects Abroad gave the academic heads a chance to choose books they felt would assist the learners in their subjects, so that the volunteers could accurately meet the schools’ requirements. One of the teachers from Yelebe Fana said that “This is something we have failed to meet for the past years due to budget shortages, so it has been a welcome surprise for our school”. The donation was part of a monthly community outreach, which began in 2014 and involves Projects Abroad staff and volunteers in Ethiopia regularly visiting the schools to see where they can assist.